The excitement of Saturday’s event is receding a bit; I have subsequently thought of further things that came up in the discussion that will be relevant to readers of this blog. One important point is David’s repeated emphasis of how ‘cheap’ IPC were. For instance, to get stories reprinted or translated, they didn’t photocopy the art, send out the copy and keep the originals carefully for future reference: instead they sent the originals out to Spain or wherever, where the new text was physically pasted over the original words on the artwork itself. The original logo was torn away and pasted over or drawn over (and typically in IPC generally the artist signature was tippexed out, though people can’t have always been that rigorous over that because quite a lot of signatures survive). A good example of this is shown in the Rodrigo Comos page below, which is from “Horse From The Sea”; it survives because it was reprinted in Princess (David is not aware of any other Jinty pages having survived). The logo itself was produced in house and was again not copied for re-use week by week: typically the same logo was removed from week 1 and re-pasted onto the space left for it on week 2’s artwork, from what David says. The company didn’t want to spend money on storing old artwork; it simply didn’t value anything it wasn’t immediately using. David recounts horrific stories of mistreatment of artwork – used as cutting mats when working on newer art, or put on floors to soak up the rain. (Yes, really!) 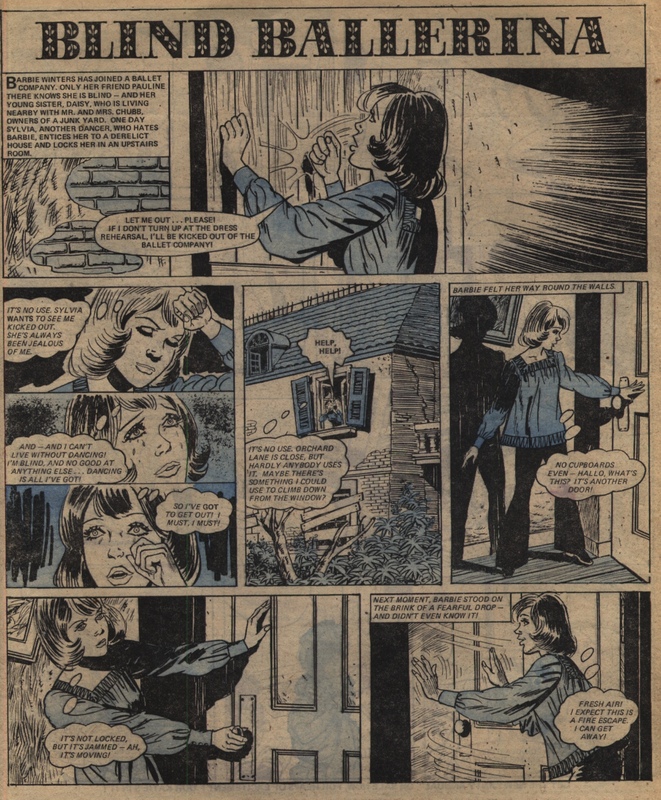 Apparently there was a huge bonfire (literally) of girls comics artwork once the company decided it didn’t need it any longer. 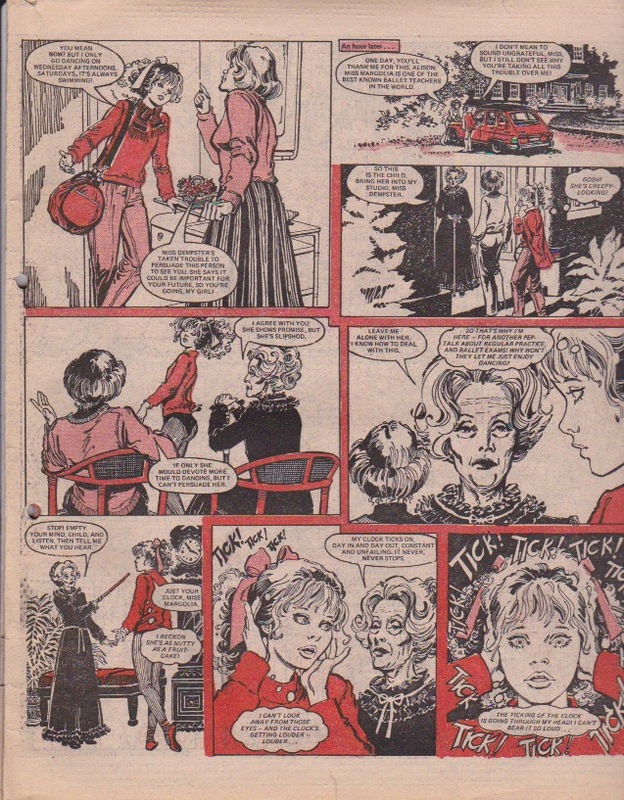 When people say that none of the IPC girls’ comics artwork survives, this is the history that they are referring to – one in which a relatively recent reprint of Misty (as recounted by an audience member) was done from issues of the weekly comic, not from pristine art cleaned and tidied up. One feeble ray of hope might be that if the originals were sent to Spanish or Dutch publishers who had a better approach to keeping the artwork then perhaps some might be found in those countries, as David does not think that artwork sent for translation was typically returned to the original publishers. I took the opportunity to ask David how it came to be that Tammy published credits in the later issues. His memory of Wilf Prigmore’s answer (the Tammy editor at the time) was that Wilf just decided to do it withouth asking anyone’s permisson, and no-one made him stop. David’s assumption was that the credits continued until the cancellation of Tammy but in recent posts on this blog we’ve seen that this wasn’t the case. Did a new editor take over Tammy in the final weeks after 11 February 1984? In any case, many heartfelt thanks are clearly due to Wilf and his unilateral decision! 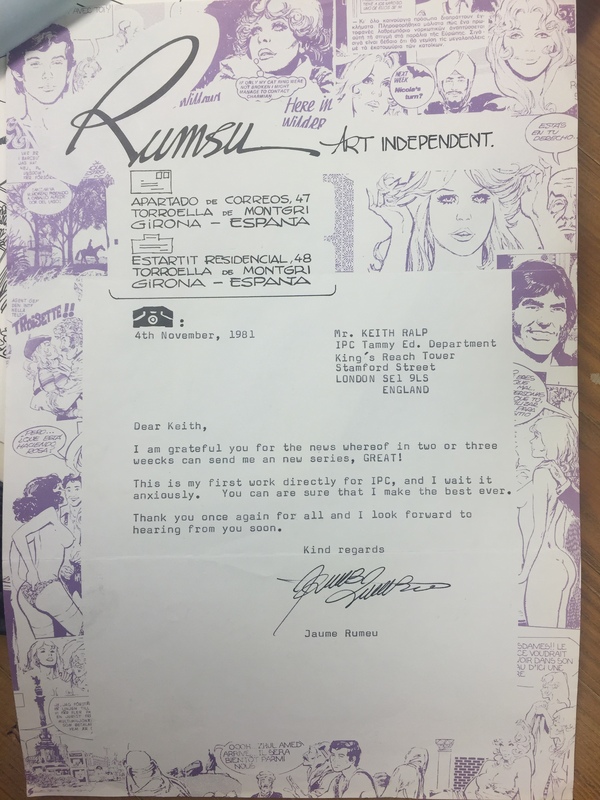 I also thought to ask David something that there have been a lot of myths and rumours about, namely why were there so many Spanish artists in girls and boys comics of the time? He is the right person to ask about this (he has a book in the works about Spanish artists, which I shall be keenly interested to hear more about when any announcements are made). His understanding was that there was simply so many pages to be filled at the time that the British artists simply wouldn’t have been able to do it all! He specifically demystified the assumption / rumour that the Spanish artists were paid less and therefore undercut the rates of the British artists – they were paid the same. And of course there are a great number of extremely good Spanish artists, too, so the British publishers were very definitely getting their money’s worth. I nearly forgot to mention one particular key point – in thinking about the pay ledgers that David saw, he was able to tell us that in the 50s, the absolute majority of names on the pay books were of female creators – perhaps 90%. Comparing that to the 70s and 80s, the number of female creators involved had obviously gone down subsequently. This was tentatively linked with the fact that the number of years that each female creator was visible on the pay books was not all that long, overall – perhaps a few years each, or some ten years of career visible on those ledgers at maximum per creator. Were they stopped from working once they became wives and mothers? Clearly not entirely so, by the anecdotes recorded from Alison Christie and Benita Brown, both of whom wrote at home while bringing up young families. But that was later, and times could well have changed by then. There are many more snippets that I was very interested to hear at the talk, from audience members too. I will try to add key items to this post as they come to me, without making it hugely long. Three weeks into 1981, but winter chill is still in the air in Jinty – see the dog’s breath on the cover? 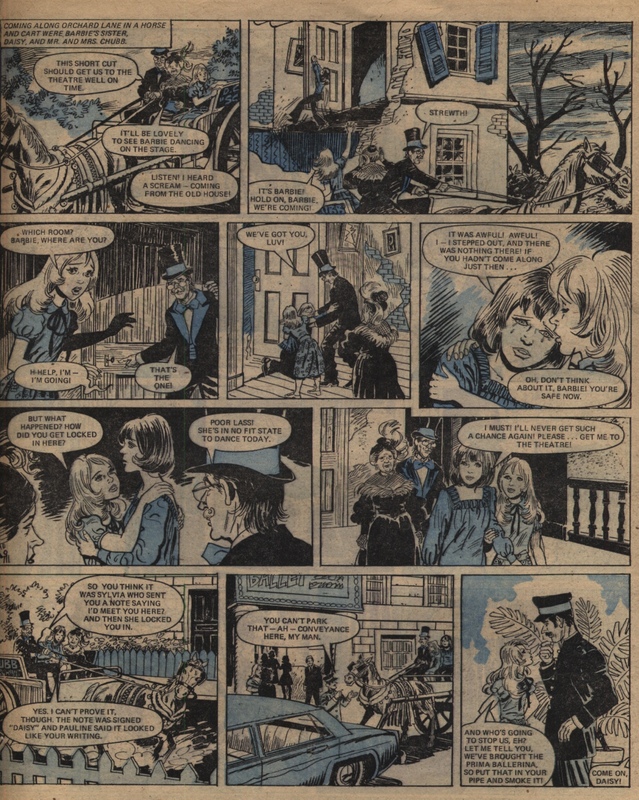 The chill continues in “Gaye’s Gloomy Ghost”, with Sir Roger trying ice skating, but a spoilsport is out to destroy the fun by smashing the ice to pieces. In “Land of No Tears” there is chill of a different sort – Perfecta’s idea of disciplining Cassy is to force her to take a shower that is 10 degrees below zero! We learn that this is what Perfecta does with herself every morning, for twice the length of time. We all encounter a scheming cousin/foster sister/stepsister story now and then, and it’s happening in Pam of Pond Hill. Pam’s cousin Veronica is making all sorts of bragging claims about her abilities, and Pam is beginning to doubt they are true. But Veronica has turned everyone against Pam, and even her best friend Tracey doubts her. However, the blurb for next week hints that Pam will expose her cousin. Ferne has sworn never to dance again to punish her father, whom she blames for her mother’s death. But we know she won’t be able to keep that up. Sure enough, Ferne gives in and starts dancing secretly. But that is already leading to repercussions when fellow ballet student Jolie spots her dancing from a distance without realising who she is. And Jolie is a big blabbermouth! The plot is really going to thicken now. The lengths Marie is forced to go to because of her jealous godmother’s mandate that she wins no medals – this week it’s turning to vandalism to avoid winning a medal! What next? This week’s Gypsy Rose story prompted a intriguing letter from a reader later on: the reader’s name is Gaynor, she is thirteen, and loves gymnastics – same as the girl in the story! Gaynor must have treasured this issue forever to show her family. 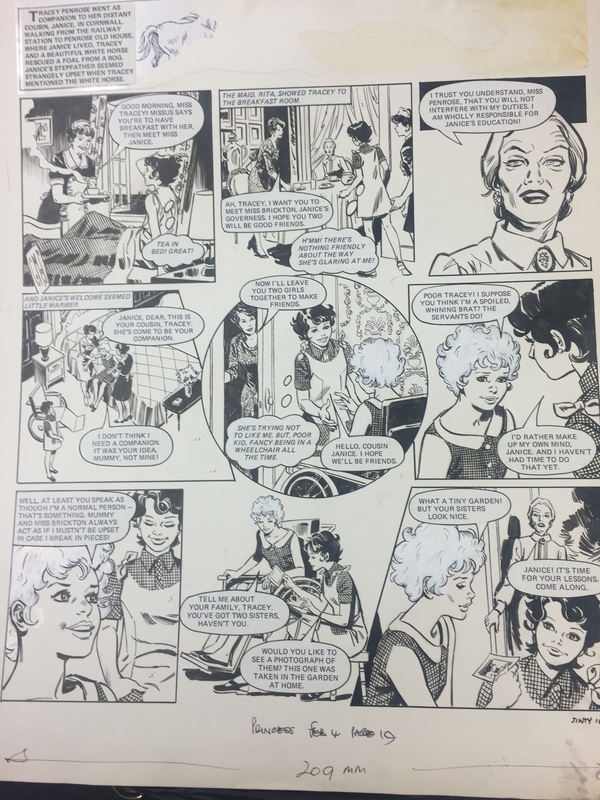 Gypsy Rose looks like she has been drawn by the same artist, so this must be a completely new story, one of the few Gypsy Rose stories of 1981 that is not a recycled Strange Story. Tansy is put in charge of minding a neighbour’s budgie this week. Sounds simple? Oh, no, we know it will get complicated. In “Life’s a Ball for Nadine”, the goalkeeper gets some unusual training to get her back into form. She, Nadine and the others are catching rubbish thrown by her unruly rock ‘n’ roll brothers who don’t like the acts in a talent show that aren’t rock ‘n’ roll – especially the disco act, of course. As the cover announces, there are two new stories in this issue. And the moment we open up the issue, we see the first one: “Casey, Come Back!”. Josie Stanton lives a lonely life with her grandfather. While not downright cruel or abusive like some guardians we’ve seen in Jinty, grandfather does not show Josie any affection, takes her for granted, and just expects her to work hard on the farm. Casey the dog is the only friend Josie has. Then grandfather deprives Josie of even that when he sells Casey! Looks like he’s taken Josie for granted once too often. The other story is another Trini Tinturé story, “The Disappearing Dolphin”. An underwater archaeological dig turns to mystery when a dolphin shows up and then disappears without explanation. “The Four-Footed Friends” is now on its penultimate episode, so we will be seeing a new story pretty soon. Mrs Marshall finally pushes Laura too far with her ridiculous carry-on about germs and mixing with ‘common’ people. So now Laura is running away, with the dogs in tow! In “The Forbidden Garden”, they have advanced the programmed rainfall, which puts Laika’s precious plants in danger of being ruined. Talk about “it never rains but it pours”! In part two of “Nothing to Sing About”, Linette’s father dies. Linette blames the fans, despite her mother saying it was just a heart attack that could have struck at any time. Linette’s bitterness is making everyone suffer, and she’s vowed never to sing again. Hmm, that may be harder than you think, Linette! Pandora has been confident that she can get by at stage school without her aunt’s box of witchcraft. But her confidence is shattered when she gets mixed feedback on why she was such a hit at her school show, with some saying that she is not all that good and just gets noticed because she is “so pushy” and a “big-head” (no arguments there). So she gives in to her aunt and accepts the box. In “A Girl Called Gulliver”, Maloney snatches Gwenny’s bag to get his hands on the Lilliputians. But then a policeman gets his hands on Maloney! However, more trouble is soon brewing for the Lilliputians, in the form of a vacuum cleaner and then a cat, whom Minty is determined to fight. Bizzie Bet hopes the Hobbies Fair will make the Easies more active. But of course they go for a hobby where they can still go easy. And it’s yoga. Maybe they should try meditation too.